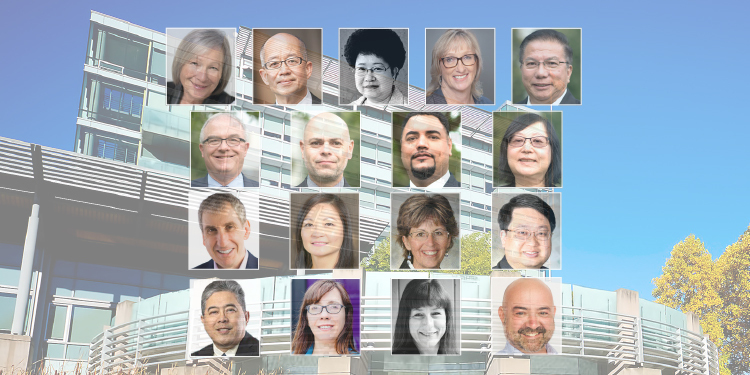 There are 26 candidates for the Richmond Board of Education, including incumbents Eric Yung, Donna Sargent, Debbie Tablotney, Sandra Nixon, Ken Hamaguchi and Alice S. Wong. (Jonathan Ho is attempting to transition from the Board of Education to Richmond Council). Why are you running for office? This would be an opportunity to give back to the Richmond school district and my own community, something I have wanted to do for a very long time. What are the top four issues in this election and explain your position? Inclusion and mental wellness—We need to continue to build on current programs to create equal opportunities for all students to reach their maximum potential in preparation for their future. Building more community agency support and interaction. Proper training and support for those teachers and educational assistants on the front line. We must ensure that the health and well being of all district personnel is being observed in order to provide the best opportunity for our students. It is a team effort no matter what the role. There must be an avenue to be heard (with support being deemed depending on the need) particularly for the teaching and support staff who are facing head on the difficulties that arise every day. I will continue to support the implementation of the SOGI policy and work with the stakeholder groups, students and families and hopefully dispel some of the fears while working towards the understanding of this safety and anti-harassment policy, as it affects us all. I look forward to learning more about the new or expansion projects and the need for seismic upgrades in the long-range facilities plan. Future trends with regards to land use, the ever-changing community demographics and enrolment projections are crucial to decision making. Why are you running for office? To help our young people to live a full meaningful life for years to come. Why are you running for office? I like to serve for community with my volunteer experience at schools, and also can take part of decision making on various issues. • City Center School—Indicated that the population of City Center will grow within these coming years, unfortunately City Community Plan didn’t save land for school. School District needs to work closely with the City to ensure that a school will be built to accommodate the increase of student population in City Center Area. • Seismic Upgrade—My priority concern is safety, school need to be safe for staff and students. Over twenty schools in Richmond School District are needed for Seismic Upgrade. School District work closely with government, delivery of school seismic mitigation projects in Richmond. Hoping that it will meet the goal to be completed by 2030. • SOGI Policy—As a Trustee, I need to listen and respect parents’ voice. The passed SOGI Policy still need review and make amendment, communication is the way for getting both side to know and understand. Need to restore parent confident on public school system and hold back their trust for School Trustee. • Catchment school for student—Richmond School District has four closed schools, meant that the Kindergarten students are not accepted and enrolled at their catchment except sibling. That made parents mad and some decide to move away Richmond. I suggest that school district need to give advance notice to parents before enrollment start, and give them more choice to choose from their neighbourhood school. And Board need take action to solve these problem as soon possible. Occupation: Insurance Broker/trustee for the Richmond Board of Education. Bike/bus/car? I like to ride my bike when possible especially when training for the Ride to Conquer Cancer. I take transit when going to downtown Vancouver or other busy areas. I do drive if the other two are not an option. Why are you running for office? When first elected, the board faced having to make serious cuts to class size, composition, arts programs and support for students; while a number of these have been restored or retained, I feel there is new and exciting work to be done in the areas of safe and inclusive schools, student engagement and capital planning. • Capital planning/Long Range Facilities Plan (LRFP)—The new board must publicly consult on and adopt a facilities plan that accommodates our rapidly changing demographics and future educational program needs. We must ensure that students and staff have safe, accessible and environmentally-healthy buildings in which they can learn and work. Facilities should be energy efficient to maximize savings on operating costs to preserve classroom funding. My experience as a trustee will be invaluable during the consultation process and in the final decision making leading to the adoption of a LRFP. • Supporting student learning and the new curriculum—Teaching and learning are shifting from teachers as facilitators to coaching students to become inquisitive about who they are, engaging them and encouraging innovative thinking. It is important for the board to ensure that the proper learning resources, technology and training are in place to assist teachers and administrators in meeting the changing needs of the classroom. I feel that it is the board’s responsibility to hold the Ministry of Education accountable for fully funding the collective agreement not only for classroom needs but also to address recruitment and retention of teachers and staff. • Safe and Inclusive schools—It is not only important to provide structurally-safe buildings but to also ensure that the school environment fosters a sense of belonging and supports respect for diversity of all students, staff and their families. Students learn best when they are nurtured by caring individuals in a supportive environment. Trustees must ensure that policies are in place that consider and respect the needs of all students and staff. I have served on the policy committee to not only develop new policies but to amend old and outdated ones. This work is ongoing and extensive and I look forward to continuing this work. • Student Mental health and Wellness—This issue is crucial due to the fact 5,179 BC children were hospitalized for mental health concerns in 2016-2017. Suicide is the second leading cause of death for children and youth in Canada. One in five teenagers say they have considered suicide. LGBTQ youth are 4 times more likely to attempt suicide. Students increasingly suffer from depression, anxiety, ADHD, substance use and self harm disorders. We, along with staff, stakeholders and parents need to lobby the Provincial Government to provide increased wrap-around mental health services that are easily accessible for both young people and families. Bike/bus/car? Most of the time I drive my car. Why are you running for office? Because of my passion for community service and public service, I can help other people including children. • Underfunding of our public schools—I believe in enabling our children’s individual potential by providing them the best quality education. We cannot have quality education unless we adequately and properly fund our public education. My commitment is to advocate for adequate and proper funding of our public education and to have more support for our teachers and students with special needs. • School Closures and Catchment Issues—Stop school closures and review catchment regulations. I will make sure that our catchment regulations are properly followed and fair to everyone. If there is a need to be changed, proper consultations to all stakeholders will be done. • School Safety—Safety upgrades should be done. We cannot jeopardize the life and safety of our students and staff. No act of discrimination including bullying shall be allowed. The rights of students and staff under the Charter of Rights and Freedom and other corresponding legislations shall be respected and observed. We should adhere to our Inclusion Policy to promote peace and harmony in our schools and our community. My commitment is to advocate for a healthy, inclusive and safe learning environment for our children and staff. • City Centre School—Build a city centre school. One of the reasons why Steveston land was sold is to have a city centre school. I will hold those who voted for the sale of Steveston Land accountable to explain why until now there is no City Centre School. If I will be voted as a Trustee, one of my priorities is to have plan to address the need for a City Centre School. Why are you running for office? After many years serving as a director on various not-for-profit boards in the City of Richmond, I would like to use the governance skills I have learned, and provide effective leadership on the school board, by listening to the concerns of all stakeholders. Parents, students, and teachers want to feel their concerns are heard and that they are respected. As the governing body of the Richmond School District, trustees need to listen to all stakeholders and implement methods of communication, that can improve the flow of information between the school board, the teachers, and the parents. An effective and respectful communication pipeline, will help all sides understand the concerns of the stakeholders, and the challenges faced by the School Board to address and implement the concerns brought to the School Board. Richmond is a city of diversity, with many cultures and religions—improved communication will foster harmony and respect with all parties, and help the school district build for the future. The Richmond School District, has many schools in dire need of seismic upgrading. With the BC provincial government’s recent announcement, that 2 more schools will receive seismic upgrades, the truth is, Richmond has fallen way behind when it comes to upgrading its schools. Students, teachers and all school district employees, need the assurance that the school district will do everything possible to speed up the process of seismic upgrading, for all schools in the district that are in need. This will take leadership and the will of all trustees, to have a loud voice and close communication with the Provincial Government. With the rapid development and building of numerous new condo towers in central Richmond, many new families with children, are moving into the new towers, and their children have no schools located nearby. Children from the city centre, are being enrolled in schools that are a great distance from where they live, creating the over population of other existing schools. This important need will only be implemented with leadership and vision – something must be done now. The Richmond School District and Richmond City Hall, must work more closely together and communicate with each other on a more regular basis. With the rapid growth of our city, the city and school district must become more aligned when it comes to planning for the growth and vision of our city. There is no logic to providing a huge spurt in population, without planning for the placement of new schools to serve the new families. With improved communication and aligning their efforts, city hall and the school district can better plan for the future. • Kids and staff safety is of utmost priority and our schools are not safe until the necessary seismic upgrades are completed. We need to put an expedited plan (and mitigation plan) for all the schools that need seismic upgrade in Richmond by working with all levels of governments and stakeholders to allocate the necessary funds and resources. • Parent and youth engagement in civic politics has been very low resulting in work that does not necessarily reflect their priorities. We need to analyze the situation and put programs in place to encourage youth, parents and staff engaging in shaping up the school policies. I have been having several ideas from stakeholders that I will bring to table for further consideration and discussion. We need to look at the current engagement level, identify motivation factors and put a plan for execution to achieve the desirable engagement level. • Bullying and being felt discriminated against are issue we have been making good progress to address however there is still more that we need to and can do. I will consult and work with all stakeholders (youth, school staff, parents and subject matter experts) to identify actions that strengthen our anti-bullying policies and programs while promoting harmony and acceptance and encouraging working together for common good. One program would be implementing hotline phone number to provide support and guidance to students reporting bullying, discrimination or similar incidents. Another would be identifying a day in the school year for all the schools to celebrate multiculturalism and how we can leverage diversity to strengthen and enhance our schooling community. • Extracurricular activities are an important element of our education system and school board can do better. We need to support initiatives, work with societies and organizations to introduce new programs that are accessible and affordable by our schools. Why are you running for office? To be able to make a difference in the quality of education that my children and the children of my friends and neighbours receive here in my beloved hometown. • Seismic upgrades for schools in need—our elementary schools have always been the centres of our neighbourhoods. We can not lose any more of them. • The need for a city centre school—we are seeing more and more young families in the city centre area and the schools are full. We are in a position where a favourable deal can be made to have a school subsidized by a developer. • Diversity in the elective curriculum—while preparing our children for a fast-changing digital world, we also need options for programs teaching agriculture, financial literacy, entrepreneurship, and mindfulness. • Hunger—there are still a shocking number of students in Richmond who arrive to school hungry. We need to create programs or partnerships that provide hungry students with a healthy snack at school. Why are you running for office? As an immigrant who has benefited from the BC public education, being able to serve on the Richmond Board of Education is one way I can give back to our society. • Inadequate Ministry funding—To ensure students’ success, I will work with the BC School Trustees Association and stakeholders to advocate for adequate and sustainable funding to support school programs. I will support the Richmond Board of Education’s annual meetings with our four MLAs to discuss local issues and to present any budget recommendations to the Select Standing Committee on Finance and Government Services. • Safe and healthy schools—The Richmond School District embraces diversity and inclusion. To create a safe and healthy learning environment, promoting mutual respect and harmony, I will support implementation of policies and programs to contribute to the safe and healthy growth and development of our students. I will collaborate with our community partners to utilize our resources to support initiatives for both physical and mental wellness for students, teachers and staff. All seismic upgrade projects must be monitored and completed. • School catchment issues—I will review the school catchment policy to ensure that it is equitable and followed through. A comprehensive consultation process with stakeholders must be implemented if there is any need to change. • City Centre School—The Long-Range Facilities Plan (LRFP) is a working document that forms the basis for the Richmond Board of Education’s capital asset management decision making. The LRFP report of June 2012 projected that there would be a significant increase in student enrolment within some specific areas in the city centre, where there is new housing development. If elected, I will work with the Ministry of Education and City Council to build a City Centre School to ensure those students who live within the area can attend their neighbourhood school. • Seismic upgrade—Make realistic and steady progress. Far too much time has elapsed since the identification of the dangers posed by earthquakes. Set out a time-scheduled plan for completing all the necessary work. • Funding—Continue with a combination of advocacy and budget tradeoffs, as well as considering our education model. Why is there a funding crunch? Is increasing funding the only progress to be made? Heart-to-heart talks are needed with the Ministry of Education, the teachers and the BC School Trustees Association. • SOGI (Sexual Orientation and Gender Identity) implementation—Move forward, with fine tuning, as needed. Also, deeper explanations and reassurances are needed for the parents. SOGI is addressing an identified high risk and vulnerable segment of our student population. • Achieving student potential—Identify special programs for different student populations. For example, special needs, highly motivated (Incentive), art, band, dance and sports. Parent choice needs to be expanded, clarified and advertised. The district must be pro-active in adequately promoting available options, so that families and students are aware of the various programs in our district. Why are you running for office? I strongly believe that children deserve everything we can provide to build a successful future and it has become my passion and dedication to support them by ensuring they receive a proper education of paramount quality. • Marijuana in school grounds— With the legalization of marijuana in October, I advocate that all schools must expand the “no smoking no drug” policy to include ingestible marijuana, so that students will not have access to marijuana within the school grounds. • Seismic remediation—It is good to know that three out of forty eight schools are being upgraded to seismic prevention as we speak. I advocate to push for more funding from the provincial government so that other schools can be upgraded to better protect our children and school staff. I am committed to work towards a safe school district for our children and continue to push for more assistance from our government. • SOGI—Due to the major differences in both language barrier and cultural backgrounds, many people in Richmond have different opinions towards the recently implemented SOGI. If elected, I advocate to continue communication with stakeholders towards SOGI, push for more transparency in its regulations, and to monitor the policy so that it is working for all parties involved. • School enrolment—Richmond school enrolment has been an issue. Both elementary and secondary schools are facing the same issue. I advocate to liaise with stakeholders, teachers, staff and parents to come up with a workable plan to resolve this issue so that our students can have better access to education they deserve. Why are you running for office? Public education is the key to everything and I believe my knowledge, passion and integrity are needed to ensure we continue to have the very best public education system possible. • Capital/Seismic—The Board of Education has worked hard over the past 4 years developing a long range facilities plan. We must ensure each of the recommendations in that plan be pulled out and have an extensive, collaborative process about the current and future needs of our district. We must continue to strongly advocate for capital funding for our seismic needs to ensure our schools are safe environments for our students and staff. I believe strongly all students must have a neighbourhood school that is of the highest quality. Neighbourhood schools help to create caring, welcoming communities and puts an arm around each student as they make their way through life. • Funding—The Ministry of Education is currently in a funding review process and it is essential we continue to be involved with that process and share the views of the needs of our community. We must also continue to strongly advocate that our system is adequately funded in order for all students to reach their full potential. • Inclusive/Safe Environments—Every student is entitled to and must have a safe, caring environment in which they can learn, grow and be successful. It is our job to ensure such a place. Each student comes with their very own way of being and that should be celebrated and supported. No child should ever feel they are not valuable and nor important. • Collaborative District—to ensure we have the highest quality public education system we must all work together. It is very important that our partner groups are at the table and their meaningful involvement is key. Working very closely with the City of Richmond and community groups will help to build that system. Working with our provincial association (BCSTA) is very valuable and I am proud to say I have served on that Board for 4 years and work hard to make a difference Provincially. We are 60 districts strong and working with my colleagues from around BC helps to ensure districts like ours is supported. Why are you running for office? Many initiatives (seismic remediations, inclusive policies) are just starting, and I wish to see them through to completion and be responsible for any changes needed. • Seismic remediations—We have 28 schools with at least one “high risk” building section in Richmond. With the four projects currently approved, a lot of work is still needed to advocate for seismic remediation projects for the rest of our schools, to get all of our staff and students in safe facilities. I am committed to working to make sure we get the funding needed to remediate all facilities in use by the school district. • Inclusive policies—With updates to our general Vision statement/Policy 100, a new Code of Conduct and SOGI policy all having been put into place within the last year, it is important to monitor how well these are working, communicate with the community and remain open to feedback. I will work with all of our stakeholders and have an open, accountable process for monitoring how well our policies are working. • Long range facility plan—The school district’s long range facility plan highlights the responsible use of all of our facilities, which includes possible changes to catchment areas, the need for a City Centre school site etc. This has the possibility of the significant changes to the school district and I am committed to seeing that a consultative new plan that gives all Richmond students the best possible chance for success is put into place. • Stable funding—The Minister of Education launched a new review of the funding formula for all school districts earlier this year, and we expect the results this fall. Richmond has an interesting mix of issues: a history of declining enrolment that has levelled off in recent years, urban cost pressures and staff wages, a large number of English language learners which all need to be advocated for in a new funding formula. I am committed to advocating for increased, stable funding for Richmond and working for a fair funding formula for Richmond. Why are you running for office? I am running for office because I believe I can provide strong leadership to our school district, based on my years of experience working with children with special needs, my experience running community sports organizations and my belief that our students deserve the best education we can provide. • Student Safety—We have to make our schools safer for our students. We need to continue with the seismic upgrading of our buildings, as well as ensure that all schools have appropriate safety supplies and effective emergency management procedures. I would also like to see us complete the development of a concussion management program for students that includes a comprehensive set of “return to school” guidelines. • Student Facilities—As already stated, we need to complete our school seismic remediation program. But we also need to consider – are we better off using government funding to renovate old schools whose capacity exceeds the needs of the neighbourhood, or does the district “chip in” and pay more for a new building that meets the needs of the neighourhood. The need for a school in the city center has been a promise made by some school trustee candidates. Before spending millions of taxpayers dollar, we need to do our homework to ensure that our dollars are being spent effectively and responsibly. To have a school costing millions of dollar sitting half empty, would not be a good use of taxpayers’ dollars. • SOGI Policy—In June the Board of Education passed a stand alone SOGI policy. This proved to be very controversial as evidenced by the highly contentious last board meeting. Unfortunately, there was much misinformation bandied about and confusion on what, exactly, the SOGI policy is. I will work to clarify the policy in our community and seek to help people understand why this policy is so important to the school district. • Student Programs—Mental health is an increasingly prevalent issue in our schools. I will work to increase the supports and programs for student who face these issues at both the Elementary and Secondary level.